Posted on February 18, 2007	by Linda S.
edit….. I’m sorry, but Daily Stitches is no longer online. I have found another great blog. 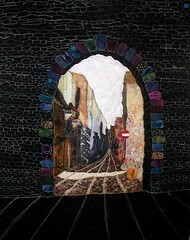 Daily Stitches is a new quilting, stitching, knitting. ..the needle arts… blog by Joanne W. And such talent! This is one of my favorites of her quilts. If you click on the pic it will take you to her Flickr site where you can see it in detail…lovely. This entry was posted in Handcraft, Handwork, Knit, Needlework, Quilt, Sewing, Tutorials. Bookmark the permalink. I believe it is a street scene from Siena where she was lucky enough to study for a while. She does a Tuscan quilt art retreat every year, sounds heavenly. Thank you for all the useful links! You are more than welcome, Corina. And you have a wonderful blog yourself. I love your quilts!